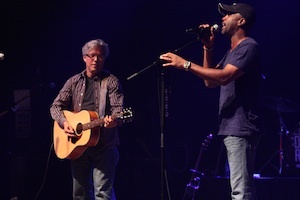 Radney Foster and Darius Rucker perform at the inaugural “Darius And Friends” on June 7, 2010. Luke Bryan, Sam Bush, John Cowan, Radney Foster, Randy Houser, Dustin Lynch and Justin Moore will join Darius Rucker for his sold-out, fourth annual “Darius And Friends” benefit concert on Monday, June 3 at the Wildhorse Saloon in Nashville. Proceeds from the event go directly to St. Jude Children’s Research Hospital. Since its inception, “Darius And Friends” has grown to include a charity auction and a celebrity golf tournament and has raised more than $225,000 for St. Jude Children’s Research Hospital. This year’s event is sponsored by Transitions® lenses and Visionworks®, including the “Darius And Friends” golf tournament to be held in Nashville on June 4. Celebrity golfers include Nashville Predator J.P. Dumont, country artists Jay DeMarcus (Rascal Flatts), Colt Ford, JT Hodges, Charles Kelley (Lady Antebellum), Dustin Lynch, Justin Moore, David Nail, Joe Don Rooney (Rascal Flatts), NASCAR Hall of Famer Darrell Waltrip and more.